The Baobab – An Ark of Mankind? The Baobab tree is a true icon of Africa, but perhaps even of humanity. No other African tree is regarded with equal love and reverence as the majestic Baobab. Where ever it is found, it is treated with respect and protected.They have been incorporated into ritual systems and are surrounded by myth and mystery. When I started to write this article on the baobab I had no idea where it would take me. It is one of the wonderful aspects of working with, and exploring African Botanicals; it always leads you down unexpected pathways, back into the mists of time. Luckily most generations will not have to mourn the death of their family guardian, as the baobab can live for millennia. The Chinese say that, “it is a wise man whose grandfather planted trees,” but due to the great age baobabs can reach, to plant a baobab is to touch not just the grandchildren but history itself. A baobab can provide its multifarious benefits for generations to come. If we count a generation as a full lifespan from birth to death with an average of 72 years, a thousand years would span about 13 generations. According to Jack Pettigrew the extraordinary resilience of the baobab, and especially the longevity of its pods, might have ensured a supply of food that was obtainable during volcanic winter which could have made the difference between life and death, and therefore the baobab might actually have been responsible for the survival of humans on the planet.. Keep in mind that the Toba event occurred in the days before harvests, granaries and prescient Josephs. This speculation does not seem so improbable when you look at the venerable history of the baobab in Africa, the cradle of mankind, and the remarkable qualities of the baobab – a veritable ark of humanity. In West Africa the tree’s leaves are among the most valued vegetables. Fresh baobab leaves provide an edible vegetable similar to spinach. In nutritional power baobab leaf is quite surprising. According to various reports it contains 11 to 17 percent crude protein and with an amino-acid composition comparing favorably with that considered the ultimate for human nutrition. Isoleucine, leucine, lysine, phenylalanine, tyrosine, threonine, tryptophan, and valine all occur in adequate amounts. The leaves contribute a protein of vital quality. In addition, the levels of both riboflavin and vitamin C have proved adequate in the leaf samples tested so far. The young and tender baobab leaves contain good levels of provitamin A, and it is notable that the trees thrive in the kind of dry and impoverished locales where a lack of vitamin A constitutes one of the worst nutritional deficiencies. However to maintain a high level of provitamin A level in dried leaves, it is important not to dry the leaves in the sun. Leaves dried in the sun have only half the provitamin A levels of leaves dried in the shade. The fibers of the inner bark can be made into cordage, ropes (very high quality with a performance comparable to nylon), harness straps, mats, snares and fishing lines and nets, fibre, musical instrument strings tethers, bed-springs and bow strings. The knot or the soft inner bark is also woven to produce gudza cloth and nhova bags in Zimbabwe as well as many different household items such as storage bags, beer strainers and clothing. (Ref) The fibre is the best for making the famous ‘kiondo’ baskets of Kenya and for making supple and extremely strong bags. 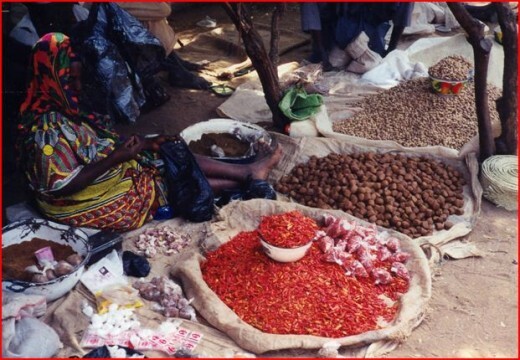 Many a harvest moves from field to village and then on to market in a baobab bag. In addition strong, tough and tear-resistant paper is also produced from the fibre which is commercially exploited in India for currency notes. The wood contains some tannin, and the acid pith is used to coagulate rubber. The roots, when boiled, produce a red-purple dye that is suitable for dying fabric. Glue can be made by mixing flower pollen with water. The universal symbol of The Tree of Life symbolizes many things, including wisdom, protection, strength, bounty, beauty, regeneration and redemption. All of these qualities are reflected in the qualities of the baobab. In spiritual traditions around the world “The Tree of Life” is seen to be like the Creator as it sustains creation with its abundant fruit, protection and generativity. The Tree of Life is also like human beings; as we develop roots, and strengthen our trunk and branch out to a wider vision of life, we grow in stature and strength and eventually blossom into full flower and fruit. We are earth-bound and yet reach up toward the heavens, trying to touch back to the source. It is hard to imagine any other tree that would better embody the worldwide symbol of the Tree of Life than the baobab. Whether or not the baobab saved humanity from extinction and served as the Ark of humanity, I can think of no other tree as an icon for humanity and who knows, perhaps one day it might once again become our Ark. Survivalists have long lists of things to do for a possible catastrophe. I have only one – plant a baobab. A Northern Nigerian speciality. This green soup is made with powdered baobab leaves and thickened lightly with dried Okro. Very tasty and serve well with tuwo shinkafa (ground rice). Wash and clean the fish, if using fresh fish, sea son with salt and pepper. Grind tomatoes, on ions and chillies. Pour the stock into a large pot, add the grind ingredients and oil and cook for 15 minutes, add the Okro and kuka leaves, stir and cook for 10minutes. Season to taste and serve hot with tuwo shinkafa. Wash and dry baobab leaves, carrot, onion and garlic. Cut baobab leaves and onion into 1 cm pieces, carrot into thin threads, and garlic in fine pieces; set the cut pieces aside. In a large bowl, combine the cut vegetables with the minced meat, the cassava starch, black pepper and salt; mix thoroughly. Add salad oil to a frying pan or skillet over medium heat. Add the vegetable mixture and saute or fry gently until cooked. Baobab leaves could be replaced with other vegetable leaf. Excellent entry, you never disappoint! Wow I did not realize how versatile this tree was, and I am still in love with they ancient way they look. The pictures are beautiful, and the entry itself is a wealth of information. Outstanding, really. I really knew anything about this tree, until you posted your entry before this one, and now I have learned even more! Great to see such a detailed article on the amazing baobab, have you seen BaobabSuperFruit.com? It’s got some really delicious contemporary Baobab recipes, and there’s lots of information on the rural producers and where to buy baobab products. Thanks Tim, I will put the link up with the others. Sophia, thank you for the wonderful article on this beautiful tree and all that it is to the people of Africa. Please have a look at our new website, centered in the USA. http://www.baobabfoods.com. We also have a Facebook page, and we’ll want to share bits about this wonderful tree and it’s fruit. Please join us at http://www.facebook.com/pages/Baobab-Foods/149719861714053. Thank you for the wonderful article on the mighty Baobab tree. The Creator has provided us an unrivaled source of sustenance and healing. Amazing. Thank you Mary, it is indeed miraculous!